1831 - The Adventure Begins! Throughout Britain during the 1820s, ‘industrial revolution’ was transforming society. Machines were increasingly displacing the vital work of labourers. As a result, social stresses and economic hardship ensued, affecting large sections of the population, especially in rural areas. It is hard to say what prompted James Worts and his brother-in-law, William Gooderham to plan to uproot their families and move to the ‘new world’ from the Suffolk/Norfolk region of Britain. Were they feeling the pressures of profound societal change, or were they simply following their adventurous spirits that locked onto a vision of the great potential of life in Muddy York? Perhaps it was a bit of both. We may never know for certain. But what we do know is that, in 1830/31, Worts and Gooderham developed a plan to move their families across the Atlantic in order to build and operate a windmill on the shores of Lake Ontario. With Worts’ skills as a successful miller in the community of Bungay, Suffolk, and with Gooderham’s head for business, as well as money to invest, they formed a strong partnership. 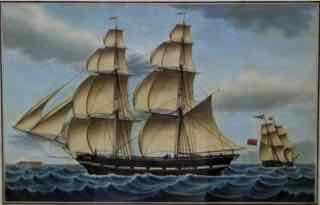 As the plan evolved, James Worts, along with his eldest son, James Gooderham Worts (not quite 13 years old), would sail from Great Yarmouth to North American in May of 1831. Worts’ wife, Elizabeth Gooderham (sister of William Gooderham), would stay in Bungay with the couple’s other children until the mill was built. In 1832, Elizabeth, William, their brother Ezekiel and all the rest of the family would complete the emigration to York (now Toronto).